It is much more efficient to have done everything as a a single job, it takes less time, less disturbing and you will figure you’ll still have some money left in your pocket for some other bits and pieces (which you can use them to do something else). If you need a local renovation company in London area, to undertake refurbishments, just give us a call. We will send our local team to you, straight away, to give you a quote. What involves a complete bathroom refurbishment? A complete bathroom refurbishment involves the removal (and disposal, we can also keep some of the stuff at you convenience) of everything was old in your bathroom. Next to removal, is preparation of the surfaces and the plumbing, you’ll need a plan to figure where you’ll want the bathtub (if is not the same place as before) or the shower installed, the washbasin, the toilet and the towel rail. It is highly recommended to change the old piping, so a new rerouting of the pipes will be necessary. We have the best plumbers in the area to undertake this part of the job. Further on, you will have to choose the bathroom suite, find (or we will use our main suppliers in London) the local warehouse in London area (but be careful to have the exactly measurements before making any purchase – like the measurements of the new bathtub – has to fit on the place you want; or the shower tray and the shower enclosure; etc. After all connections were done, the next step is to prepare the floor and wall surfaces for the new tiling (you can choose from having porcelain / ceramic, mosaic, marble, stone or quarry tiles), so you will need our local tiller. 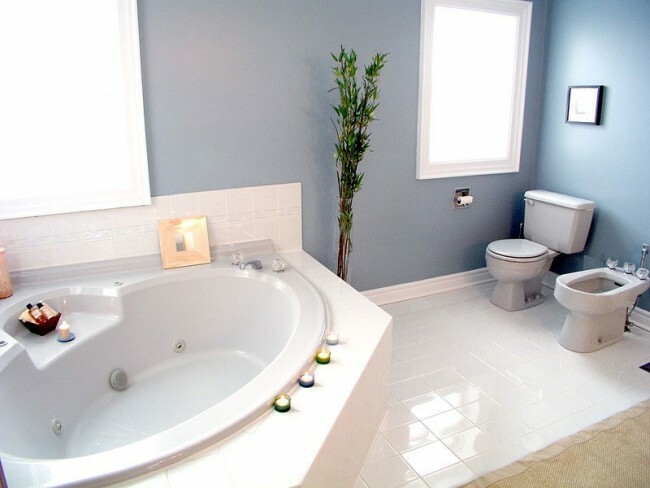 If you choose to do not have laid tiles on all walls (that means you’ll have tiles only above the washbasin and the bathtub / shower area), then on that surface you will need someone to apply some special bathroom paint. The bathroom refurbishment project will be finished by testing if everything is working properly and a proper cleaning of the site. How much cost to refurbish a standard bathroom in London area? During the last years, people just start to feel a bit more confident in making investments in their homes (that’s probably because we’ve been hitten by a global economical crisis, or… they just like what they have until now), and, even they request quotes over quotes to have a ball-park figure about how much will it cost them to refurbish the bathroom, they don’t actually aim to start the project straight away. Not a bad idea (I would do probably the same), but if you really need some changes in your home, why not? Quotes are free, all over the world (not 100% so sure about that, but ours are free), we will not ask you for money just for a quick visit and an email sent with some work description and a price for labour work. Finally… we don’t charge you at daily base rate, nor we have a fixed price ro refurbish a bathroom, after all, not all the bathroom has the same size and same for the bathroom suite which will come in, nor all are the same. Get a quote for a complete bathroom refurbishment. Make sure you you specify all that you need, or at least a rough idea about what you need. Go to Quick Contact Form on the right side of the page and ask for what you need. I will get back to you in the shortest possible time (same day – usually within a couple of hours since the request was sent).